England's batting on the second day of the final Ashes Test at The Oval was shocking, but hardly surprising in the context of this extraordinary series. Whenever the going has got tough, batsmen from both sides have run for the hills. They have been completely unable to cope with pressure and have tried to attack their way out of trouble against the moving ball. They call it the modern way, but it's the wrong way. The likes of Adam Gilchrist, who used to counter-attack Australia out of trouble, are once-in-a-generation players. The long history of Test cricket will teach you that when your backs are against the wall, you need to fight. You have to strain every sinew to survive. Instead we saw a succession of reckless pull shots, people driving and getting bowled through the gate and an overall approach which simply made no sense. Adam Lyth played a really poor shot as he top-edged Peter Siddle's second ball to mid-on. Why not take a look at a new bowler? Check out what pace he's bowling, see if he is swinging the ball or whether it is moving off the pitch? The beauty of Test cricket is that you have time. Bowlers are supposed to have to work out how to get you out. But England went from bad to worse. 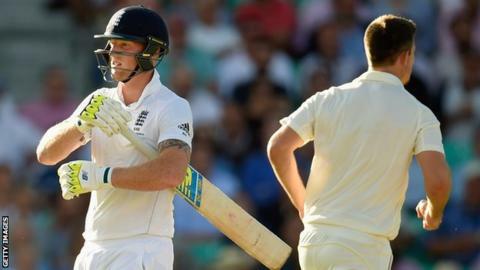 Jonny Bairstow and Ben Stokes both fell trying to take on short balls when common sense should have been telling them to sway out of the way. It was an abject display, but one entirely in keeping with a series in which logical thought has so frequently gone out of the window. We have now seen England blown away at Lord's and The Oval, and Australia bundled out twice at Edgbaston and Trent Bridge. At lunchtime on Test Match Special on this second day, former England captain Michael Atherton and Australian cricket writer Gideon Haigh joined me to discuss where this series would fit in Ashes history. It wasn't easy to reach a conclusion. There have been moments of brilliance, but the overall quality of the batting has been so disappointing that the whole series has been somewhat undermined. It is easy to mock Geoffrey Boycott's style of batting, but occupying the crease is absolutely vital in a five-day Test match. You have to put overs in the bowlers' legs and earn the right to attack. England will hate the thought of people accusing them of complacency. They will insist that they haven't taken their eye off the ball. But whether it's conscious or not, there is just not quite the same level of intensity about their performance now the series is in the bag. Australia, on the other hand, are desperate to try and win a game to save face in the series and send captain Michael Clarke out on a high. Beaten teams often bounce back to score consolation wins at the end of a series because the winning team is a bit spent. Whatever happens here over the weekend, the series will end with the batting line-ups of both teams under serious scrutiny. Those batsmen who do survive should go away and learn to apply themselves when the going gets tough. The second day saw two instances of batsmen being recalled after being given out off no-balls as both Steven Smith and Mark Wood were recalled. Bowlers Steven Finn and Mitchell Marsh had both overstepped by some distance, but the umpires are copping out of making decisions because they know they have the back-up of technology. I'd like to see umpires watching the front line carefully and only using the television replays as a last resort in really marginal cases. Bowlers who have a problem with no-balls usually try to remedy it by lengthening their run-up, but the best advice I was ever given was from New Zealand fast bowler Sir Richard Hadlee. He always said that if you were bowling no-balls, you should actually take your run-up forward so that you don't over-stretch. Finn and Marsh would be wise to heed to the legend's words. Listen to Jonathan Agnew and Geoffrey Boycott review each day on the TMS podcast.